Those backing an alternative capital underwrite for Silver Fern Farms have been accused by the company’s board of playing a dangerous and irresponsible game. Chairman Rob Hewett said the board had not been provided with any details on the proposal in which a group of agribusiness leaders have allegedly agreed to underwrite a rights issue of up to $100 million of new capital for SFF. “The board has not received a proposal. We do not know any details, we do not know who the mystery underwriters are, nor who the supposed bank is. . . .
(BusinessDesk) – Silver Fern Farms chairman Rob Hewett says the company’s banking syndicate has become tired of its relationship and it would be “a dangerous game” to test lender support in the event farmer-shareholders don’t support selling a half stake to Shanghai Maling Aquarius this week. Hewitt was responding to calls from shareholders opposed to the deal to look at alternative funding, which could keep New Zealand’s biggest meat company in local hands. The cooperative that now owns SFF would be showered in cash if the Chinese deal goes ahead. As well as $261 million that would be injected into the business, leaving it debt free with funds to upgrade plant and pursue global growth ambitions, the farmers will get a dividend of 30 cents a share, or $35 million, and the cooperative’s board would get $7 million for its costs – enough to keep it going for seven years at current rates. . . Attracting the skilled dairy workforce that farmers need to run their businesses is the goal of a new joint workplace action plan launched with the Minister for Primary Industries in Canterbury today by Federated Farmers and DairyNZ. DairyNZ chairman John Luxton says one of the aims of the industry’s 10-year strategy is to see 90 percent of dairy farm businesses having quality work environments by 2020. “We have put actions and commitments in this new plan to ensure we achieve that part of the strategy. We are competing with all the other career opportunities on offer across the globe. We’re not always the most attractive choice for many young people these days and we need to be if we want to develop and retain the workforce we need,” he says. . .
Are you looking for an opportunity, a change, a slower way of life? Then the Macraes community needs you. Stanley’s Hotel, a registered historic place, is without a proprietor and the Macraes Community Trust is on the hunt for the community’s next publican. Trust member Mat O’Connell is keen to get someone signed up to keep the pub open after failing to attract a lessee over the past year. . . The management of A2 Corporation could now focus on delivering growth following the successful capital-raising announced yesterday, Craigs Investment Partners broker Peter McIntyre said. A2, which markets milk with a protein variant said to have health benefits, raised $40 million in a discounted share placement to help fund working capital in its burgeoning infant formula business. The Auckland firm sold 58.8 million shares at 68c apiece in the placement, which was over-subscribed. . .
Five years after their lives were irrevocably changed Jo and Bryan Guy are stepping back from farming, ending nearly a century of family involvement in daily milk supply. “Someone in the family has been responsible for milking the cows every day,” Bryan says. It started when Cecil and Mary Guy began dairying in Feilding after World War I. They milked 20 cows year-round to supply milk at the farmgate for local residents. In 1954 their son Grahame and his wife Winifred bought the farm and continued to milk every day, supplying town milk with fresh liquid for bottling. . .
For 100 years, the Babich family have stayed true to the ideals of their patriarch. David Babich has a view from his office window to die for. Twenty minutes after battling through traffic from his home in Auckland’s bustling suburb of Pt Chevalier, he is relaxing at his desk at his family firm in a lush city oasis. The 47-year-old is general manager of Babich Wines, one of New Zealand’s oldest family-owned wineries. Today he is raising a glass to the company being in business for 100 years. . .
Bangladeshi rice scientists are all set to conduct field tests of the world’s first vitamin A-enriched rice, popularly known as Golden Rice, before taking the variety to production phase. The success in vitamin A-rich rice comes in quick succession of the world’s first three zinc-rich rice varieties that Bangladesh released over the last couple of years. Upon completing a successful trial of the genetically engineered Golden Rice in its transgenic screen house, Bangladesh Rice Research Institute (BRRI) is now taking the variety — GR-2 E BRRI dhan29 — to confined field trials in the coming Boro season this November. . . .
Why the surprise that opinion is divided on government plans to mine small, low value parts of the conservation estate? Opposition has been strong of voice but high volume isn’t always a reliable indicator of the numbers who share a view. If there were plans to touch areas of high conservation value I’d be joining those opposed. But providing it’s only a few, small areas of low value land that would be mined, the benefits will outweigh the costs. It may not be pretty while it’s happening, although that doesn’t mean it won’t be interesting. In Kalgoorlie, mine visits are a tourist attraction and while I’m not keen on enclosed, underground spaces I found it fascinating. Consent conditions will also require the companies granted licences to ensure that they leave the land in a better state than they found it. That’s what’s happening around Macraes in East Otago and there are other examples where people have created beauty after minerals have been extracted. We visited two former quarries while on a farm tour of the North Island last month. 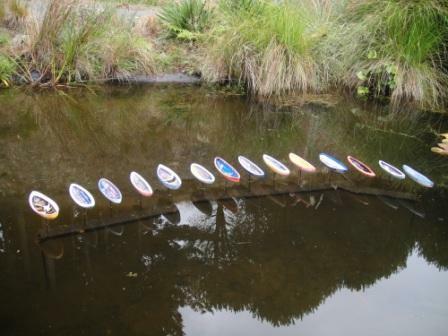 Waitakaruru Arboretum and Sculpture Park near Hamilton has become a 42 hectare place of beauty. 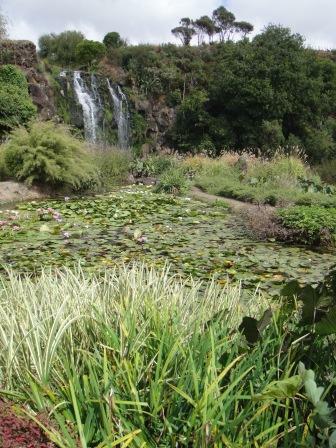 Wrights Water Garden, south of Auckland, featuring native and exotic trees, water lilies and lotus flowers. The end result of mining tiny patches of conservation land could be economic growth with the social gains that will bring and when the mining’s finished the land could be returned to the conservation estate in a much better condition than it was.